« Article about Manila’s contemporary art! Galleon Trade takes a pleasantly unexpected detour, en route to future destinations! YBCA curators invited proposals from artists to sub-curate special projects for Bay Area Now. They selected GT organizer Jenifer Wofford’s proposal to play match-maker, pairing several of the Bay Area-based Galleon Trade artists who traveled to Manila last year, with several of the artists they had met there. 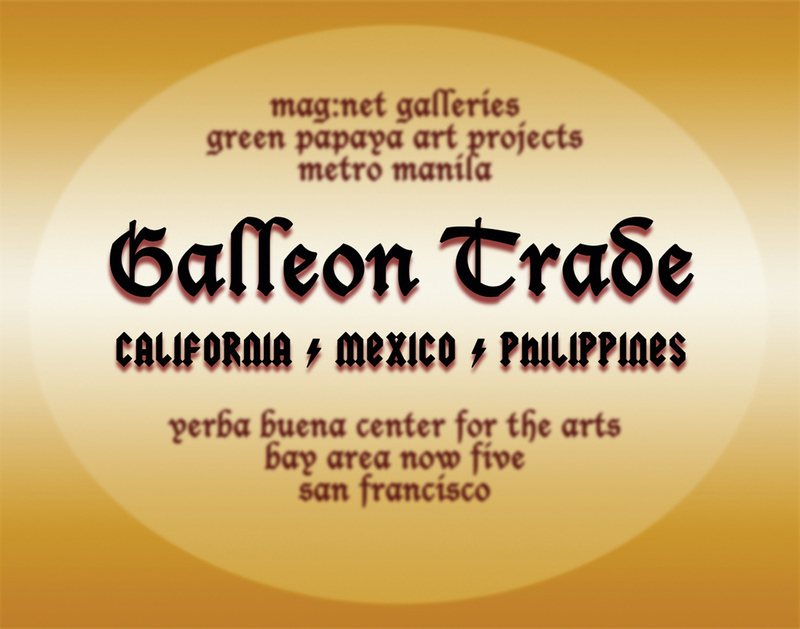 Galleon Trade is a series of international arts exchange projects, focusing on the Philippines, Mexico, and California. Spanish Galleons sailed trade routes between Acapulco and Manila (by way of California) from 1565 to 1815. Taking the historic Acapulco-Manila Spanish galleon route as its metaphor of origin, these exhibitions seek to create new routes of cultural exchange along old routes of commerce and trade. The project began in summer 2007, when Galleon Trade I brought artists and work from California to Metro Manila, Philippines. Future incarnations of this project will be hosted by San Francisco’s Luggage Store Gallery and another space in Mexico. Galleon Trade: Bay Area Now 5 Edition addresses the deeply transnational ties between the Bay Area and the Philippines by pairing artists from both places. It features work by local artists Jaime Cortez, Megan Wilson, Johanna Poethig, Gina Osterloh and Christine Wong Yap, all of whom were members of the contingent that went to Manila in 2007, and met many local artists. In the spirit of the transpacific “trade” of Galleon Trade, these 5 artists were paired up with Manila artists Maria Taniguchi, Poklong Anading, Norberto “Peewee” Roldan, MM Yu, and Yason Banal. Their works are in direct conversation with each other, each artist’s unique practice enriching and resonating with another’s. Galleon Trade sails again: more details and updates soon to follow! Best wishes to Traders Johanna, Peewee, Jaime, Maria, Christine, Yason, Megan, Poklong, MM and Gina as they prepare their amazing work for this next port of call! *Opening Night Party July 19 8 pm!! This entry was posted on Tuesday, July 15th, 2008 at 12:33 pm	and is filed under News. You can follow any responses to this entry through the RSS 2.0 feed. Responses are currently closed, but you can trackback from your own site.